"Make A Move" is the name of Gavin's current album. 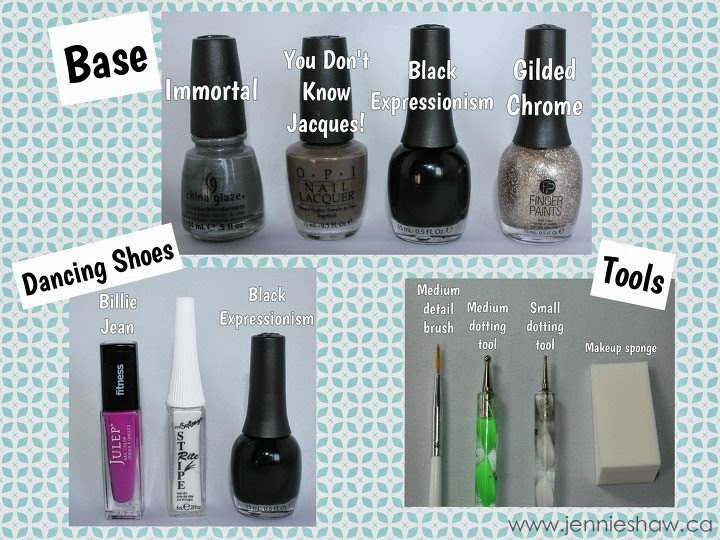 For the base, I sploged (technical nail term--not really) Immortal, You Don't Know Jacques!, and Black Expressionism on a makeup sponge and, similar to a gradient technique, dabbed all over my nail. I wanted to make a cool, non-solid background, and I'm happy with how it turned out. In total, I did three sploging coats to get opaque coverage. 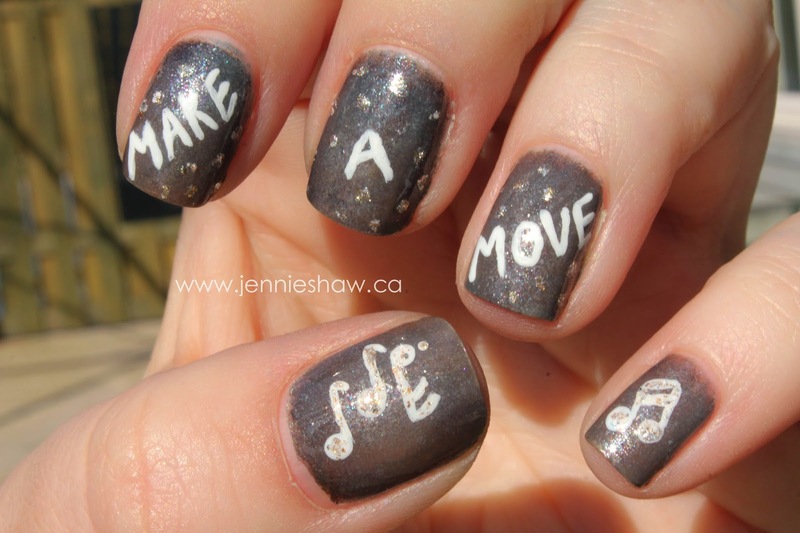 Once that was dry, I used the medium detailing brush to write "Make A Move" and the music notes. For the sparkle dots, I used Gilded Chrome and a medium dotting tool, and for the notes, I also used Gilded Chrome, only with the medium detailing brush. One of my favourite songs by Gavin is "Dancing Shoes," so that explains the shoes. Haha! For the shoes, I stared with two coats of Billie Jean. Then, I painted the top third with Paper Mache (not pictured because I forgot). Once that was dry, I did the criss-crosses with Stripe Rite in White, using the brush that comes with the bottle. The shoelace "holes" were made with one medium dot of white and then a smaller dot of black in the middle. For the finishing touch, I did a half-circle with the medium detailing brush and Billie Jean. Please note that the half-circle was the hardest part. I tried to use a paper reinforcement as a guide but it didn't create a straight line. Or maybe it was because of my shaky left hand and insanely curved nail beds, but for whatever reason, I'm not too jazzed about how the line turned out. I mean, I don't think the line looks REALLY bad, but it could certainly look better. Ah well! Guess I better practice more! Or maybe I won't practice. Whatever. Haha! I hope that everyone has an amazing weekend! YAY FOR WEEKENDS! And don't forget to link up and show off your pretties! This is so great, friend!! I hope you had a great time at the concert. And there's no way I could ever "write" on my nails! Nope! No way no how! I love how the "sploging" came out! Oooo I love Gavin Degraw! Great mani too! So cute! A little confused as to why they are so many grays as a base- could you explain please? 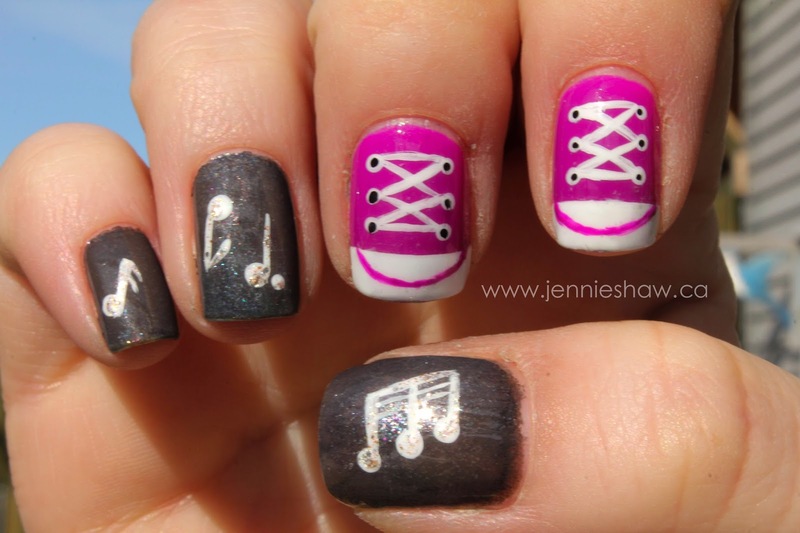 Love the converse nails too! Super cute as always! Oh my gosh Jennie, I absolutely love your nails. Too cute! Thanks for hosting the link up and enjoy your evening. Jennie you top yourself each week! LOVE this!